Brighter Futures: Support through mental illness. We are a service user led and organised group supporting anyone experiencing mental health issues. We meet on Monday and Thursday in The Age UK cafe Micklegate, Selby: 10:30 till about 12:00. 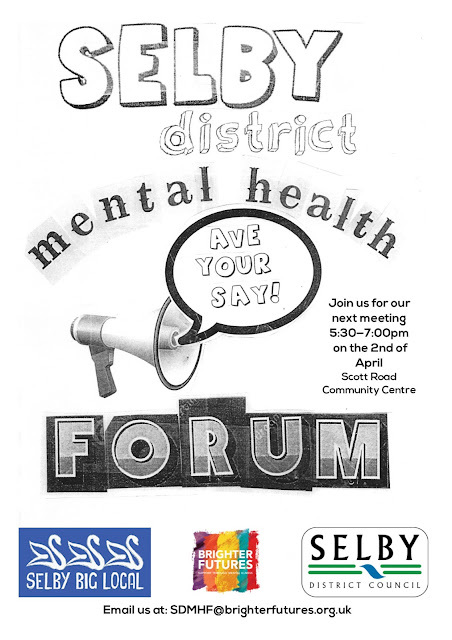 The next meeting of the Selby District Mental Health Forum will take place on the 2nd of April at 5:30 - 7pm in the Lounge of Scott Road Community Centre. Be great to see you there!